The Quartet meets with Netanyahu to try to revive the moribund “peace process.” He is considering an “interim agreement” that Abbas rejects. 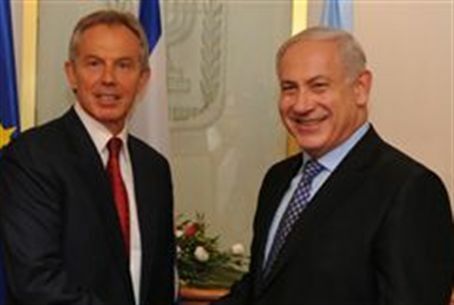 Quartet's Middle East envoy Tony Blair met with Prime Minister Binyamin Netanyahu Monday to try to revive the moribund “peace process” amid the spreading Muslim revolutions in the Middle East. As in previous discussions on the diplomatic process, official statements already are flurrying without any signs of compromise, particularly from the Palestinian Authority. CNN quoted an Israeli official, who spoke anonymously, saying that Prime Minister Netanyahu is considering a diplomatic initiative with an interim agreement, a proposal that formerly was a mandatory step in the moribund Roadmap Plan and which PA Chairman Mahmoud Abbas has rejected several times. "Of course, Israel would prefer a final status peace agreement, but that has become all but impossible because of the Palestinian refusal to negotiate," the official told CNN. His statement is a replica of his previous position that rejected several alternative compromises suggested by the Obama and Netanyahu governments. Abbas said as far back as 2009 that his strategy is to go through the motions of diplomatic talks while trying to forge international support for the recognition of the PA as an independent country. He has won the approval of several Latin American countries but suffered a defeat in last month when the United States vetoed a resolution condemning Israel for building for Jews in Judea and Samaria. Israel did not release details of Prime Minister Netanyahu’s discussion with Blair Monday, but the Prime Minister later in the day told his Likud party faction that Israel faces “a very difficult international reality” and must be careful not to endanger current construction in major popular centers in Judea and Samaria. The Quartet is to meet in Brussels this month to discuss the diplomatic process. Israel has not said if it will attend, apparently out of concern that it will be trapped into further concessions that already have alienated many if not most of his coalition members. Foreign media continue to try to resuscitate ideas that have been rejected for years. The widely respected Christian Science Monitor on Tuesday published an opinion article by Dashiell Shapiro, described by the newspaper as a “tax lawyer who has worked in the Middle East, who suggested that the uprising in Egypt gives the country an opportunity to take over Gaza. Egypt ruled Gaza until the Six-Day War in 1967 and has consistently refused to take any responsibility for the crowded and terror-ridden region. Nevertheless, he reasoned that Gaza Arabs are culturally closer to Egyptian Arabs than those in Judea and Samaria. Admitting that “the idea of returning Gaza to Egyptian control has always been rejected out of hand, mainly by Egypt itself,” he argued that a post-Mubarak regime will feel less threatened by Hamas, especially if the Muslim Brotherhood is part of the new regime.